Add a splash of U.S. pride to any party with these red, white and blue desserts from our favorite bloggers. From a pudding pop dessert recipe that displays the colors of Old Glory to star-spangled ice cream cones, your mouth will water over these six patriotic desserts that make the perfect Memorial Day or Fourth of July dessert. 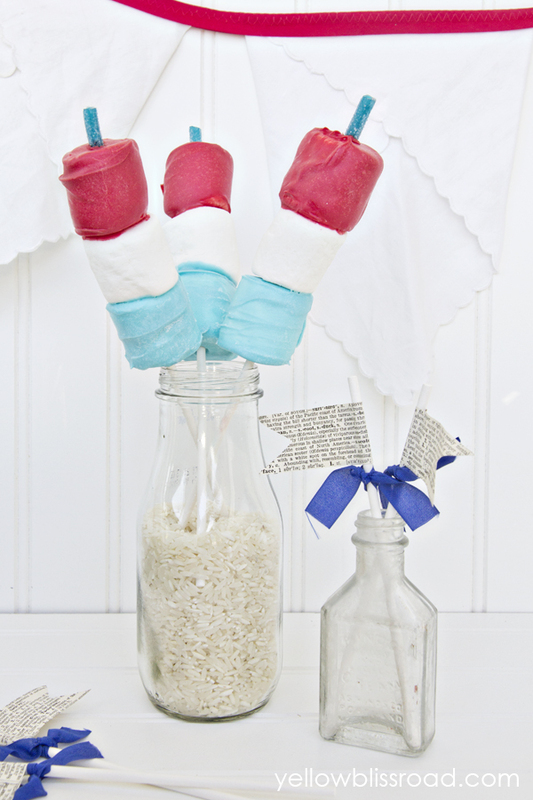 You're only three ingredients away from helping your kiddos beat the heat with this must-have dessert recipe by Real Mom Kitchen that makes the perfect sweet treat for Memorial Day or Fourth of July dessert. In a medium bowl, combine the milk and pudding mix. Beat together for 2 minutes. Place 2/3 cup of the pudding in a bowl and add some red food coloring, just enough to get the red color you want. Now place another 2/3 cup of pudding in another bowl and add enough blue food coloring to get the color of blue that you want. Divide the red pudding evenly between the 6 cups — this can be done by pouring or piping. Both work well. The pudding is still a little runny at this time so be careful if you pipe it in the cups. After the red pudding is in the cups, give them all a tap to help even them out. Now repeat that step with the white pudding that was not colored. Then repeat that same step with the blue pudding. Place the pudding pops on a cookie sheet or other freezer-safe dish and place in the freezer. 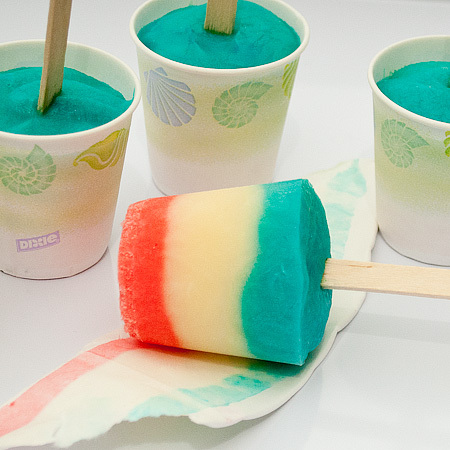 Freeze for 30 minutes. Remove the pops from the freezer and carefully insert the Popsicle sticks into the center of each pop about 3/4 of the way into the pudding. Place pops back in the freezer for at least 2-1/2 hours or longer. When ready to serve, cut a little slit into each cup. This makes it easier to remove the cup. Tear off the cups and enjoy. Makes 6 pops. 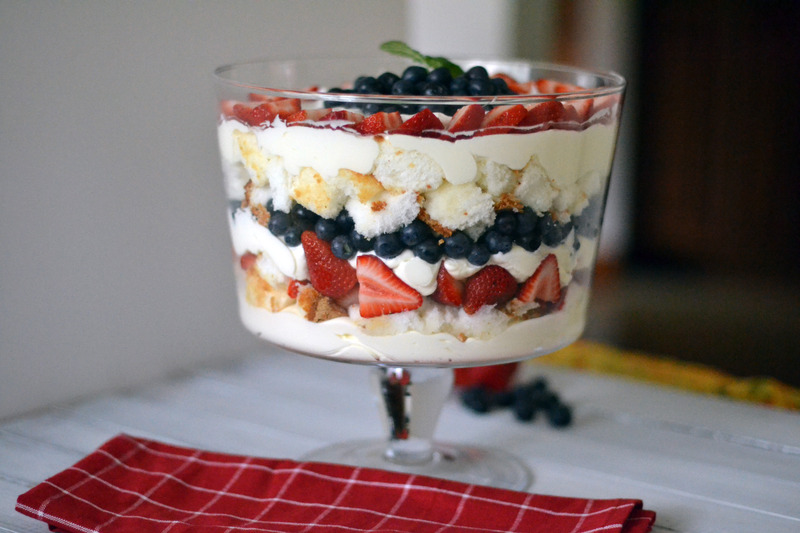 Almost too pretty to eat, this red, white and blue layered dessert by Little Bites of Everything is given just a little hint of sweetness with homemade whipped cream you just can't say no to. 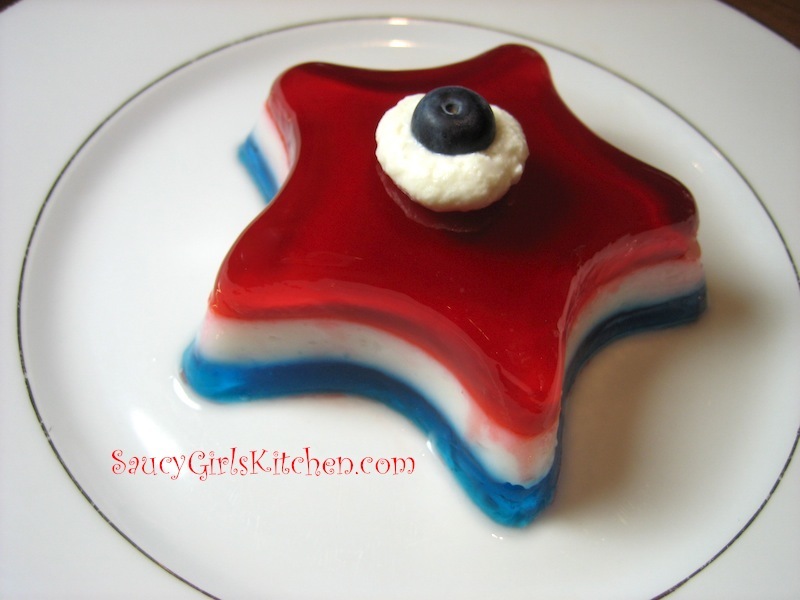 Give traditional JELL-O molds a patriotic twist when you whip up this light and colorful patriotic dessert by Saucy Girl's Kitchen that hides a yummy secret: shredded coconut. In 2 separate small bowls, prepare the cherry and blueberry JELL-O according to package directions for Jigglers (which require less water and results in a firmer JELL-O). Set aside. In another small bowl, add the unflavored gelatin, sugar and boiling water. Stir to dissolve completely. Add the coconut milk and shredded coconut. Set aside. Place your JELL-O molds on a baking tray, which makes it much easier to put them in the fridge. Fill each mold 1/3 of the way up with the color that you want to show on top. Put tray in the fridge to set first layer, about 10 to 15 minutes. Once first color of JELL-O is set, pour the next desired color 1/3 of the way. Place in fridge to set, another 10 to 15 minutes. Once the second color of JELL-O is set, pour the final color to top. Chill until totally set (about 3 hours). To unmold the JELL-O just set it in a bowl of warm/hot water for a moment and then invert onto serving plate. Don't leave it in the water too long or the JELL-O will start to melt. Garnish as desired. 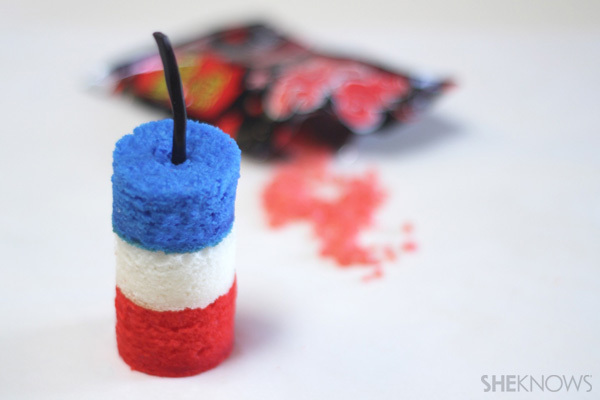 Holiday guests will be in for a big surprise when they bite into these red, white and blue firecracker cakes by SheKnows that hide an explosive secret inside. Mix white cake mix, egg whites, oil, water and sour cream for 3 to 4 minutes on medium speed. Split cake batter into 3 equal amounts, adding red and blue food coloring to 2 of the portions. Coat 3 (4 x 9-inch) bread pans with cooking spray and lightly flour the bottoms. Add the 3 batters to the pans and bake at 350 degrees F for 18 to 23 minutes. Allow them to cool and remove from pans. Using a jumbo straw or plastic tube (1/2- or 3/4-inch in diameter), remove the centers of the cake circles. Be sure to save the red and blue centers to use as plugs for later. Add Pop Rocks down the hollow centers of the stacked cakes no sooner than 1 hour before serving. Put a portion of the blue cake plugs back into the tops, covering the center filled with Pop Rocks. Cut licorice rope pieces approximately 1-1/2 inches long and insert them into the centers of the blue cakes and serve. Marshmallows and summer are synonymous, which is why this no-bake summer dessert by Yellow Bliss Road is sure to be the hit of your Memorial Day or Fourth of July dessert spread. 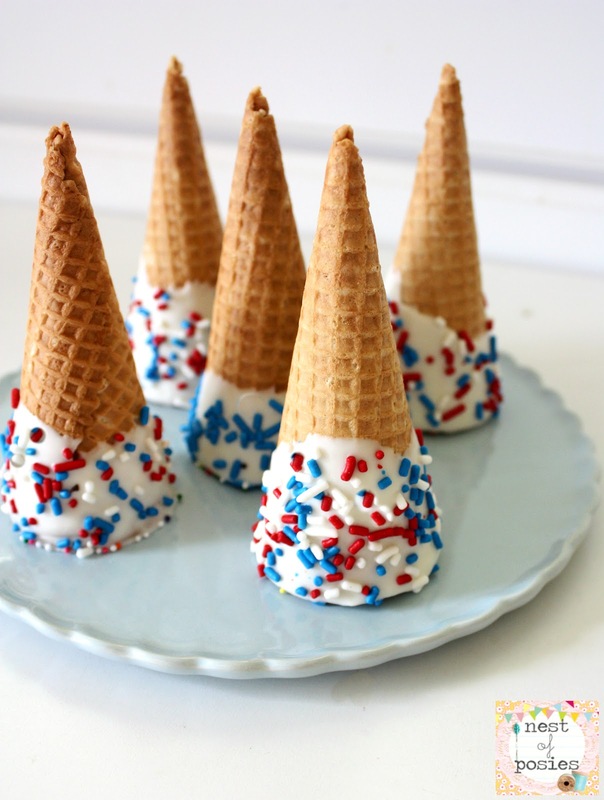 Paired perfectly with homemade sweet blue ice cream, this red, white and blue dessert recipe by Nest of Posies is so easy to do you'll never serve plain ol' cones again.